Finally, the answer to the question that’s been burning a whole in your unrelenting hearts is here. First off, how nice of you to consider me in such a delicate time. …now officially has a place in my collection. 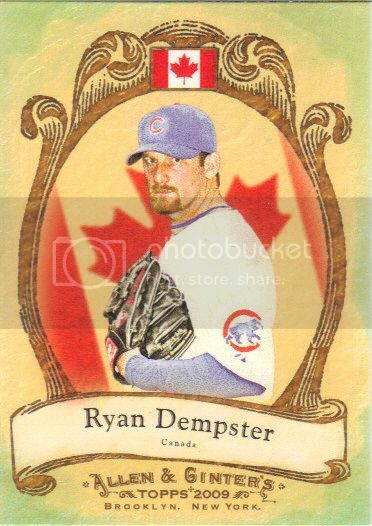 It is true that I was only collecting Cubs cards for Demp, but he was the only one I treated that way. The reason I started out Cub Only was to make my new-found collecting goals a little more manageable. When I started my collection back in May 2010, I only needed 141 cards to complete my search. Compare that to the 243 total cards I needed as of August 2012. 100 cards in 2 years is quite the jump, especially for someone that Topps tends to ignore in the majority of their sets. Stupid parallels making life difficult. 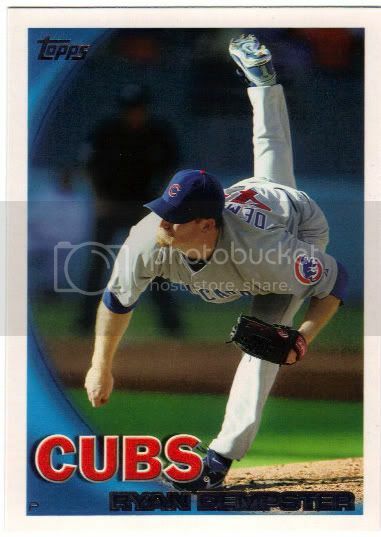 But those were just the Cubs cards, as far as I could determine. Now that I’m adding all teams, we’re looking at 458 cards. Yowza! I know that’s nothing compared to Maddux, Gwynn and FT that have lists 10X as long, but it’s still a giant leap. I have my work cut out for me. Probably the most disappointing part of this trade is that I didn’t get further along in my quest before making the switch. 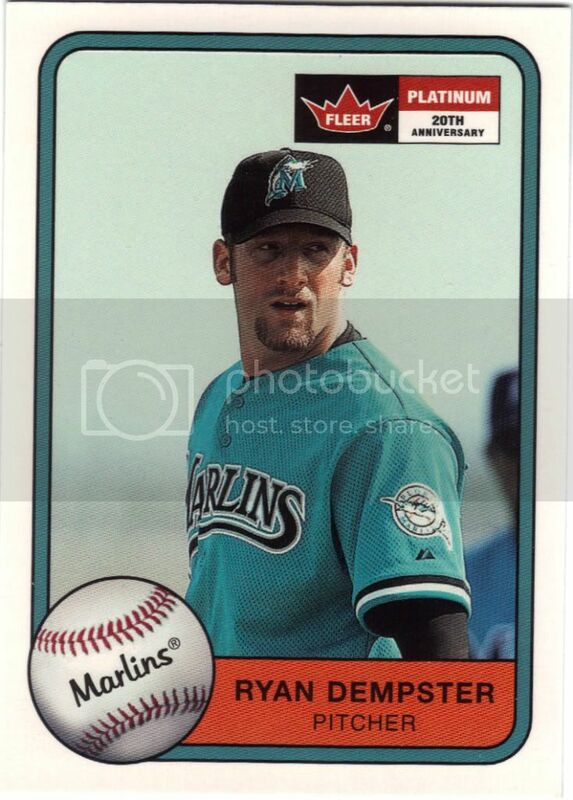 I was thinking I’d probably add the Marlins and Reds cards into the mix once I hit the 50% mark. I only made it to 31.69%. After adding those 215 extra cards, it drops me way down to 17.69%. I have to say that’s a little disheartening. A collector’s job is never done. Plain old boring normal version. Why would anyone EVER care about something like this? And neither is his organization. While looking through my folders for cards to include, I saw this in my “Posted” folder, but I can’t seem to find where I actually posted it. Maybe I need to find a better way to keep track of this stuff or go back and reconcile. Maybe I’m over thinking things. Now I know we’ve seen this picture a few times before on the blog. Get ready to see it again, too. Since the Cubs have decided to clean house and get rid of half the team, I felt like this was a good opportunity to clean up some older images in my folders. Here’s one of the Orange retail refractors. I’m pretty sure I got this for about the price of a stamp. This gets me that much closer to the 2010 rainbow. The biggest obstacle is the Abe Lincoln umpire variation, which is still going for over $100. I’m praying that I get really lucky one day and find it mixed in a dime box somewhere. Or that the price gets to about $20 eventually. Still a long way off from this rainbow, too. The good thing is that there’s no Chrome cards to go after. The bad thing is that there’s no Chrome cards to go after. 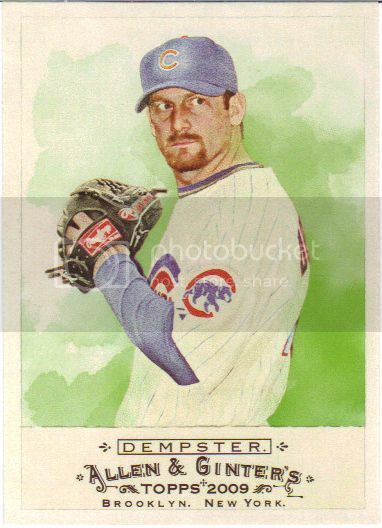 Dempster’s not good enough for your Chrome set, Topps? I don’t think he’s in there this year either. 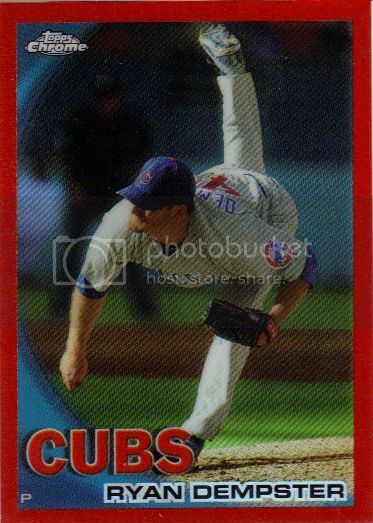 The opening day starter for the past two years can’t make the 220 card checklist? Look out behind you. It's "The Fog"
2009 Allen & Ginter really helped bring me back into the hobby. My first trade on here was for cards to help me complete the set. I later abandoned that dream, so if you need any 2009’s, I got quite a few left. I got pretty far in my National Pride insert set. Part of me likes that A&G has these massive insert sets each year, and part of me kind of hates it. Luckily, the biggest part of me is indifferent since it’s not a personal concern anymore. 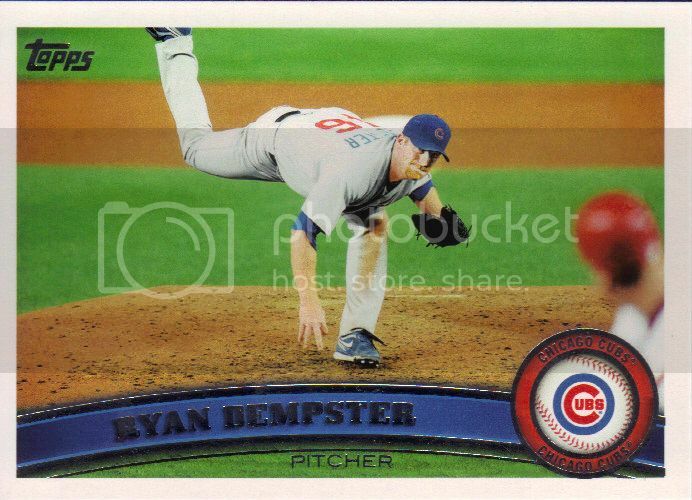 I got my Dempster, so I’m set. One last Ginter card. I still need a ton of minis, so please let me know if you have any of the variants you’d like to share. I’m trying desperately to avoid buying them and shelling out $2-4 in shipping. 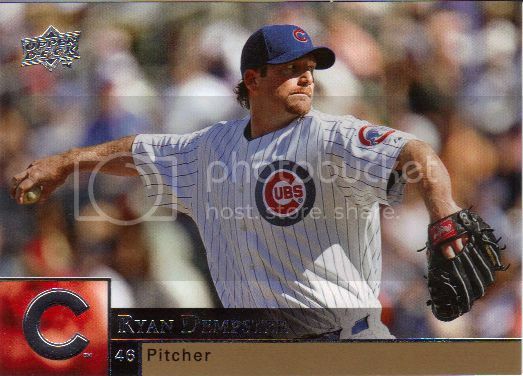 Now, I know these haven’t been the most exciting cards for most of our readers, but that’s part of collecting. And it’s still a part that I greatly enjoy. Not everything has to garner an “Ooh” or “Aah” from everyone. All that matters is that the cards get them from me. These may not be difficult to obtain, but they’re still crucial elements of my binder and I’m thrilled to have them. With that said, here are a couple “Ooh” and “Aah” cards to close things out. Two years later, it’s finally mine. My Topps Heritage stamp quest is over. 2010 Heritage had these inserted at roughly 1 per case, if I remember correctly. 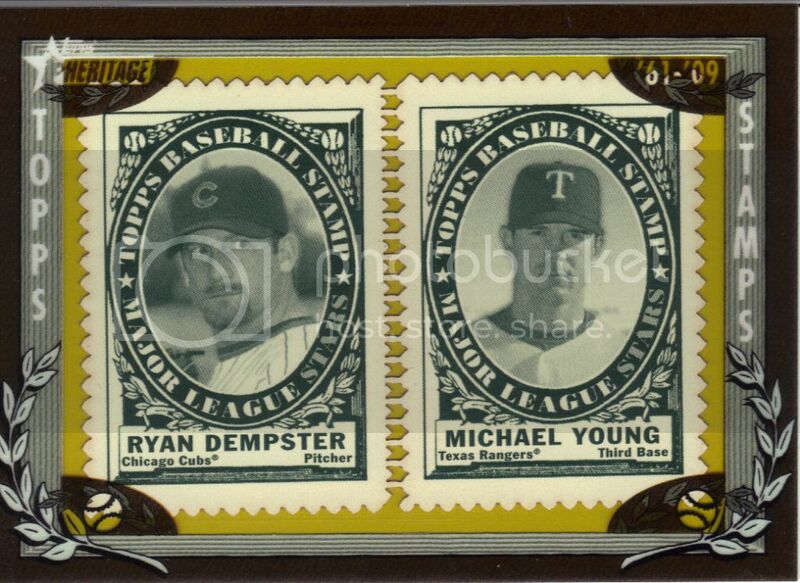 Each of the 208 players had two different stamp combinations, all /50. In 2011 they did the same type of thing, but they were /62. This is the last of the four to fall into my hands, and it took about 2 years of ebay saved searching and resilient budgeting to obtain. I would see graded ones pop up a lot, but I don’t buy graded anything (so far). Others had high Buy It Now prices or starting prices. It took a lot of waiting to find one that I could bid on, and longer for one to fall in my range. My total with shipping was $11.50, about half of what I was ultimately willing to pay. After all, I had to keep this guy company. 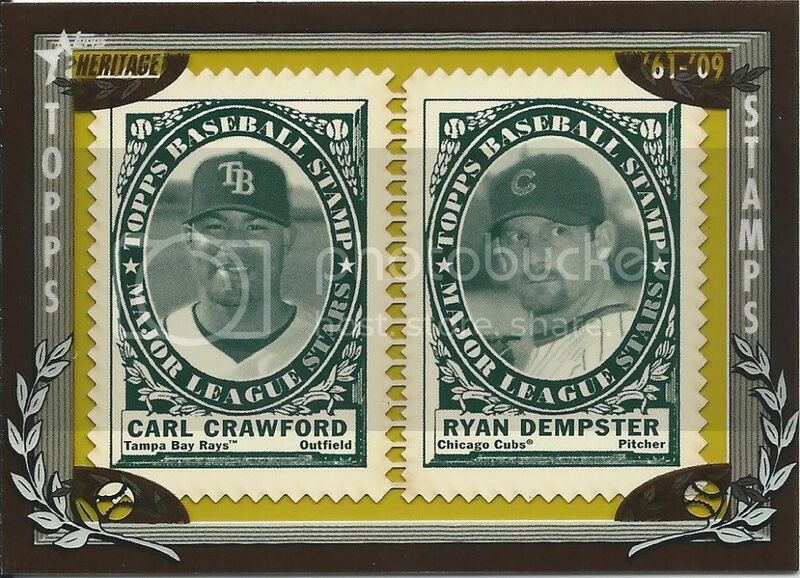 I’ve only had this for a few months too, so you can see that these 2010 stamp cards don’t come up all that often. Anyway, look at the new teammates getting along so well. They’re practically joined at the…side? I don’t know. What I do know is that I wish Ryan the best of luck with the Rangers this year. Maybe these two can give the team a third chance at a championship and bring a ring home this time. Either way, I’ll happily collect his Rangers cards. I hope he gets on track with the Rangers too! I can always send you any of his Rangers cards when I get dupes. 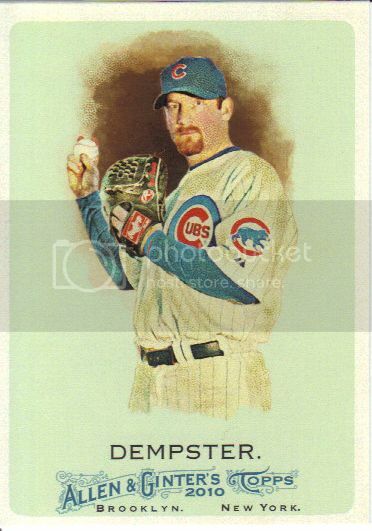 Good luck with the new goals — the more Dempsters the better I always say!